2 in 1 Collapsible Shopping Trolley Bag can hold a great deal of Its, and it can be folded and packed away. 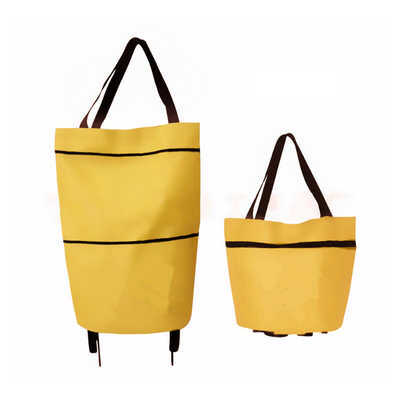 The bag can be used as both a shopping cart or hand bag, depending on your needs. Designed with foldable wheels for you to switch between shoulder bag or expand to full size as a shopping cart. Its a perfect gift for any occasion, branded with your company name or logo, will make shopping or travelling more stylish and dazzling among the crowd Material - 600D oxford Colours - Red, Grey, Rose Pink, Yellow, Purple, Blue, Green(MOQ:50), Orange(MOQ:50) Please note that The MOQ of Green and Orange colour is 50, and other colours are from 100. Product size - Unfolded: 40 x 14 x 55cm Folded: 40 x 14 x 32cm/ Without Gusset Print size - Unfolded & Folded: 12 x 18 cm. Price includes : 2wk 1 col/pos print. Setup is included.